Looking back on 2013 we pay tribute to the generous support of each and every valued funder and contributor without whom none of this would be possible! Goodbye Grade R Class of 2013 – we are proud of you! Great appreciation to our teachers and caretaker: Noeline, Nicky, Tessa, Eden, Ellamaine, Lyn and Oom Nicholaas for the tremendous amount of hard work, dedication, love and care which went into organising this hugely successful evening and event – celebrating each child’s achievements! Thank you NB Publishers for the wonderful donation of books made on the 27th November – each Grade R learner received a book of their own with their name written in each. What an incredibly generous gift, arriving just before Christmas and the learners’ graduation! A memorable day for all involved! A lovely day held at Evita se Perron, of Christmas crackers, tea, scones and Tannie Evita’s special fudge plus a movie which had 45 visiting ‘Ooms and Tannies’ (from our senior citizens program) in tears. This was a special event as 58 children from Koranrug local farm school visited the theatre for the first time, singing Christmas songs to our grannies, granddads and Pieter-Dirk Uys who was there to wish everyone a blessed Christmas. Each child had their photo taken as ‘Tannie Evita’ after their tour of the famous Theatre! Another ‘star-studded’ event – our annual music recital and art exhibition. Brave beginners and well-practiced students were given the opportunity to perform on Tannie Evita’s ‘big stage’ on the baby grand at Evita se Perron. This is always a magical way to end a year of dedication and learning and welcoming the festive celebrations of Christmas! Thank you to Judy Wood (music teacher) and Adri Van Aswegen (art and lifeskills teacher) for their time, dedication, love and care for each student whom they freely guide and inspire on a daily basis! 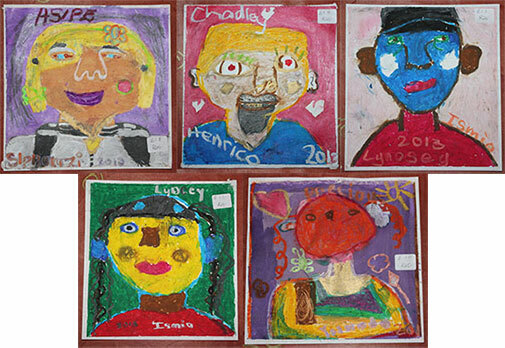 Each year the Art and Music Outreach program facilitators present a combined Art Exhibition and Music Recita. 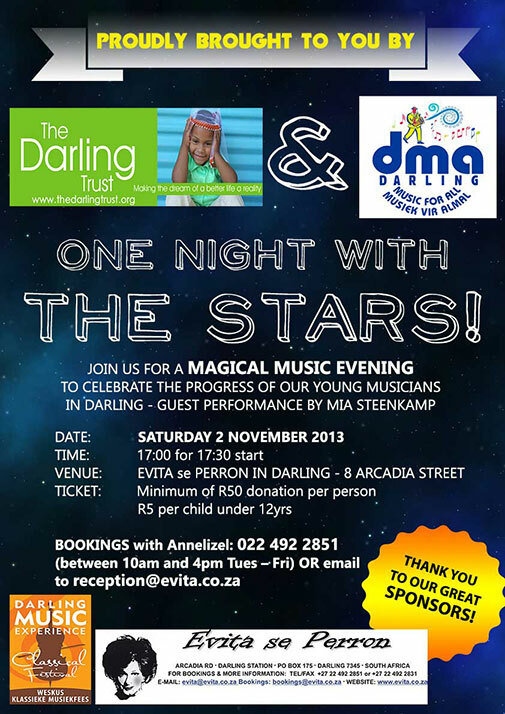 Tuesday 26th November at Evita se Perron from 18h30 – celebrating budding talent! for the dedicated learners who have worked hard throughout the year – we invite you to come and experience the outcome! 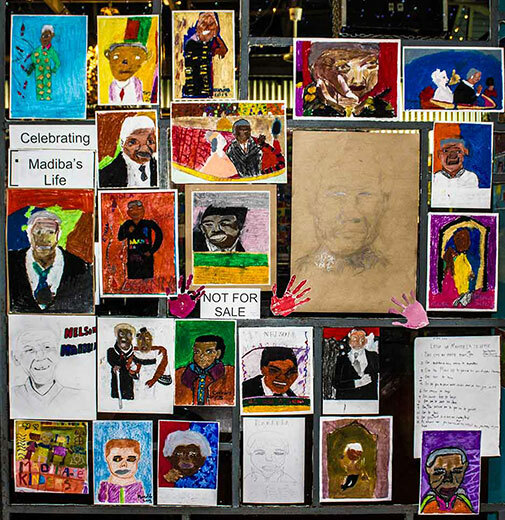 Bring some cash for the best Christmas presents money can buy – the children’s artwork is for sale! Proud parents and dedicated teachers invite you to celebrate and support this important occasion for which our 60 learners have been practicing hard! We look forward to sharing these two festive occasions with you all! 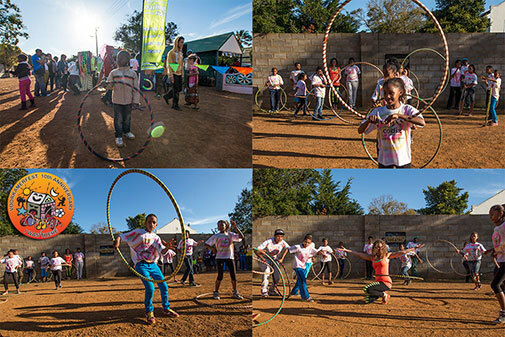 Lanel van der Kolff from The Psychedelic Theatre gave of her time to come and share her skill with the Darling youth through a workshop of fun time Hula hooping. Lanel and Zen have generously decorated a hula hoop to each child (25 children of all ages) who, with the help of Lanel and Zen, choreographed their own dance sequence with their Hula hoops, which they took home when all is done! 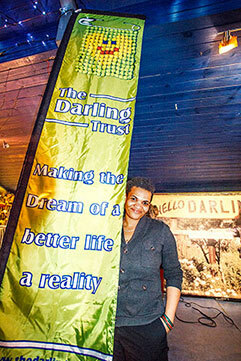 The Darling Trust sponsored the workshop and the rehearsed dance sequences were presented at the Voorkamerfest 2013. Lanel is a drama student, currently studying Yoga instruction. Thank you HuLanel for taking time to come to Darling to enrich lives with your talents, we hope you will be back soon!! 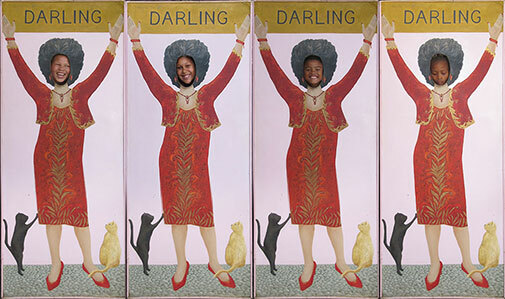 We are grateful to Bianca Amansure and her team of 9 students from UCT and UWC who nominated Darling for this Health Education program through The Darling Trust. This program will reached over200 learners of all ages. On behalf of the Darling youth, Darling Outreach Foundation and The Darling Trust I would like to thank you for considering Darling for the Healthy Lifestyle program you presented here from 24 – 26 June. Major thanks to Metropolitan Health for sponsoring this essential program, making it possible for you to bring it all the way to Darling! The children were like sponges, absorbing all you had to offer them in terms of the program as well as the care and interest each of you took with each of them. The Variety Show presented at the end to all the parents was truly an inspiring experience – and I speak on the parents’ behalf, as their feedback to us was so positive and enthused. It is thanks to Peter Goring from JUWI that The Darling Trust was able to offer free prescription lenses to the Darling community. Reach4Sight (NGO) nominated Darling as a beneficiary for a free eye testing clinic held on the 6th 7th and 8th May at 5 different venues throughout the village. Thank you to Keith and Roxanne Reid from Reach4Sight for their time given and interest taken – testing 535 pairs of eyes is quite a feat!! The frames of all specs made up are donated by Reach4Sight. Much appreciation goes to Mr Goring from a very grateful community! What a wonderful way to celebrate your birthday!! left to right: Dr Ivan Meyer, Minister: Cultural Affairs & Sport: Western Cape Government; Anna Cleophas, Trustee: The Darling Trust, Tasha St John-Reid, Operations Manager: The Darling Trust, Tannie Evita Bezuidenhout, most famous white woman in South Africa. The Launch of Library Week 2013 was held on Friday 15th March 2013 in Darling at our local Darling North Public Library. Esteemed guests from all over the Western Cape, librarians, teachers and parents were welcomed by Barneys Angels Crèche with a delightfully choreographed performance! 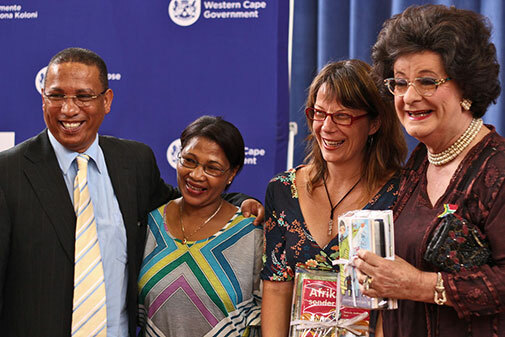 On behalf of the Western Cape Provincial Library, Dr Ivan Meyer, Minister: Cultural Affairs & Sport handed over a generous donation of beautiful books to The Darling Trust’s Parenting Project and Early Childhood Development Centre’s little school library. Thank you to all at the Provincial Library for nominating The Darling Trust for this wonderful gift of brand new reading material! Die Groen Tamatie kom Darling toe! Strutting their ‘stuff’ proudly across the stage with much concentration, each Grade R learner showed off their well-practiced moves which Lyn Hamilton Brown and their teachers have been working on during the year – to an audience of proud parents belting out their appreciation, drowning out the music!! A perfect way to end a year of hard work from both learner and teacher! 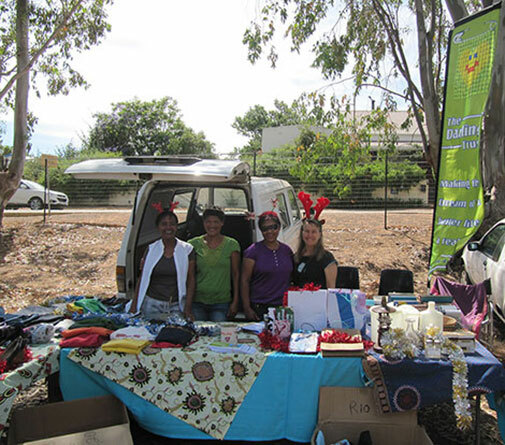 hanks to generous donations made throughout the year, The Trust was able to fill three tables of items to sell at the Museum’s Car Boot Sale as a fundraiser for projects in 2014. All items were affordably priced to go for ‘min geld of niks’! Catering to all income brackets! This is always a welcome way of contributing towards keeping the programs running throughout the year! So next time you are spring cleaning, please be sure to keep us in mind, we don’t sell all donations, we donate as much as possible! The selling forms part of our fundraising initiatives to fill the holes where funds are needed. Blessings to you all who have nominated the Trust for these donations! Lloyd from DOGZCOOL brought ‘The incredible dog show’ to Darling in October! Lloyd and his special friends performed for Darling schools and Darling College, graciously inviting Evita’s Darlings to attend for free. Thank you Lloyd for bringing your fantastic furry friends to share their wonderful tricks and talent with us all! We hope to see you back in Darling soon!!! 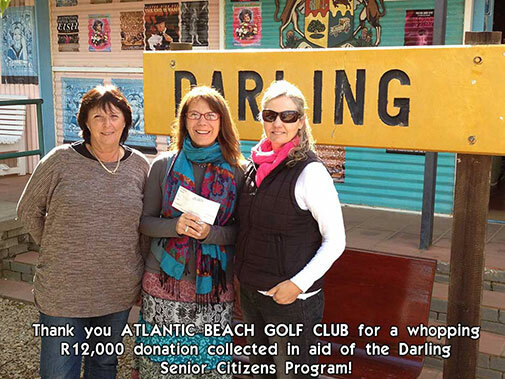 Wilmeen and Brenda drove through to Darling on the 23 September 2013 to personally deliver this very welcome cheque which made a pretty blue Monday into the sunniest Monday this year! 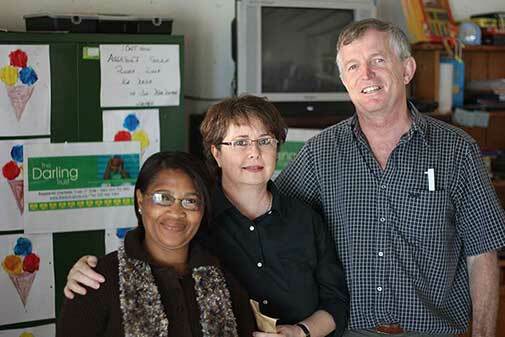 A free eye testing clinic was held in Darling on 6, 7 and 8 May by Reach4Sight (NGO) The very smart frames of all the specs were donated by Reach4Sight. Thank you to Keith and Roxanne Reid from Reach4Sight for their time given and interest taken – ‘we can see clearly now’! 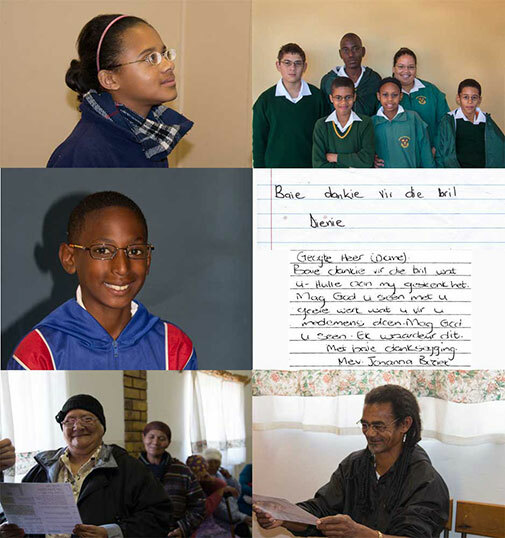 The Darling Trust sponsored the lenses, thanks to donors. Reach4Sight returned in August to personally fit each pair of prescription specs! 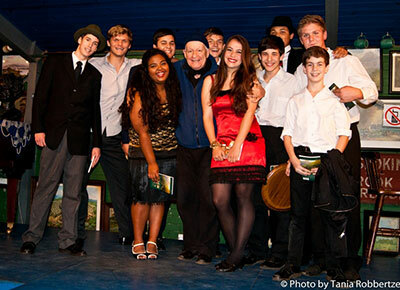 On the 15th of June The Darling Trust welcomed to stage Wynberg Boys Acting Association who performeda 30 minute version of Shakespeare” classic “The Taming of the Shrew” at Evita’s Theatre in Darling . Set in the 1920’s the production fitted the space beautifully, as actors took their spots amongst the audience while taking turns coming up on stage to perform certain scenes, this was really well received by the audience who could easy interact and get involved with the action of the play. It was a great privilege that Educape could bring another Shakespeare Production to Darling, and we hope to share more of these wonderful productions in the future. On behalf of The Darling Trust, thank you Kseniya for bringing Shakespeare to Darling again. This was a fundraiser for The Darling Trust & R575 was raised! Thank you to all those that supported. We look forward to having you all back next year and hopefully making this a standard date on the Darling calendar. Please visit Educape to see more Shakespeare. Dear Florance – on behalf of The Darling Trust and the community, a massive thank you to you and your team from your educational theatre and the @Heart testing team for taking the time to come and share the important message with our youth. Also the community role players who made time to come and see the show – we look forward to you returning to Darling for future collaboration and intervention. Shimmy Isaacs graciously gave of her valuable time to come and spend the morning with the youth of Darling at the local holiday program – not ‘talking down’ to them, but uplifting and encouraging them to dream and write! She lifted their tiny spirits, got them up and singing, dancing and feeling fabulous about themselves. Bicycles for Darling! Thank you for Sowing the Seeds in Darling…Dear Daisies and Pick n Pay! 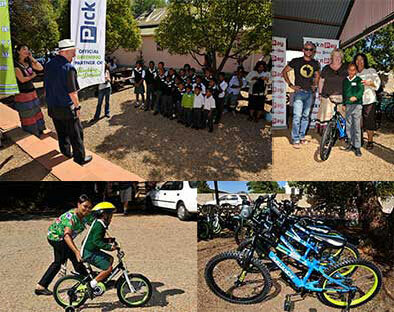 As Official Greening Partner of Rocking the Daisies and sponsor of the ‘Cycle the Daisies’, Pick n Pay has chosen to donate 15 bicycles to The Darling Trust. These bicycles have been ‘earned’ by enthusiastic visitors to Rocking the Daisies who took the effort of cycling on the Pick n Pay stationary bikes-for each 5 km cycled, Pick n Pay donated a bicycle and a helmet to children who have been identified by The Darling Trust. 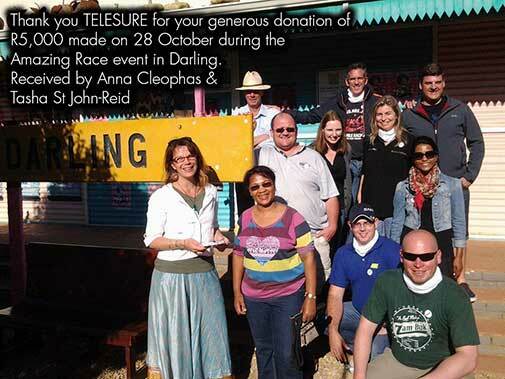 The school nominated for this generous contribution is Morning Star School on the road between Darling and Malmesbury. The Darling Trust trustees, Anna Cleophas and Ivy Johnson were present to assist with the handover of this wonderful contribution to Darling children! 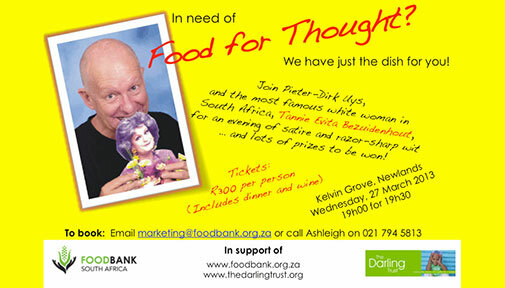 South Africa’s most famous white woman, Tannie Evita Bezuidenhout (pictured, left, & see introduction below for international readers), and renowned South African satirist and playwright, Pieter-Dirk Uys, combined in a powerful double-bill on Wednesday, 27 March 2013. They offered supporters of FoodBank South Africa and The Darling Trust a little Food for Thought? at Kelvin Grove, Cape Town. Jill Ritchie, event coordinator with the FoodBank team.